White Sox outfielder Nicky Delmonico has been diagnosed with a fracture to the third metacarpal on his right hand, the club announced. Additionally, the team has elected to option righty Carson Fulmer after another rough outing tonight, as James Fegan of The Athletic was among those to tweet. Delmonico is expected to miss approximately four to six weeks of action. The 25-year-old had turned in quite a promising debut effort in 2017. But he was struggling along with most of the rest of his team in the current campaign. Through 133 plate appearances, he carries only a .226/.331/.304 slash with 133 plate appearances. That’ll put the organization’s outfield depth to the test, with Avisail Garcia already sidelined. Daniel Palka and Trayce Thompson could function in a platoon. The other options on the 40-man roster are Charlie Tilson and Ryan Cordell, though neither has hit well at all this year at Triple-A. As for Fulmer, his outing today — which included eight earned runs and five walks in two innings — was just the latest sign of trouble. The former first-round pick has now allowed 29 earned runs with an unsightly 29:24 K/BB ratio in 32 1/3 innings on the year. He’s allowing home runs in bunches and generating a mediocre 6.7% swinging-strike rate, so there’s really not much in the way of positives at this point. Of course, he’s still just 24 years of age, so the Sox will hope he can still tap into his promise after some time at Triple-A. The White Sox are promoting right-hander Carson Fulmer to the Majors today to work out of their bullpen, according to Dave Williams of Barstool Sports (links to Twitter). MLBPipeline.com’s Jesse Burkhart first tweeted that Fulmer was likely heading to the Majors. Fulmer will inherit the 40-man roster spot that was vacated by yesterday’s outright of right-hander Scott Carroll. The Sox selected Fulmer, 22, out of Vanderbilt with the eighth overall pick in the 2015 draft. He dominated in 23 innings between Chicago’s Rookie League affiliate and Class-A Advanced affiliate in 2015 following the draft, but the 2016 season hasn’t gone quite as smoothly. Fulmer currently has a 4.76 ERA with 90 strikeouts against 51 walks in 87 innings for Chicago’s Double-A affiliate, though he’s pitched considerably better as of late. Over his past seven starts, Fulmer has a 3.51 ERA with a 54-to-17 K/BB ratio in 41 innings, and he’s yielded just two runs in his past 19 innings. Fulmer entered the season as a consensus Top 100 prospect, and he’s currently 33rd on MLB.com’s Top 100 prospects list and 73rd on Baseball America’s midseason update of its Top 100 prospects. Some pundits at the time of the draft wrote that Fulmer projected as a future reliever, and that’s still a consideration for a number of scouts, though the Sox will presumably give Fulmer a chance to stick in the rotation down the road. Jim Callis and Jonathan Mayo of MLB.com reference Fulmer’s 93-97 mph fastball in their scouting report (which could play up in a short-relief role) and call his curveball a plus offering as well while noting that his changeup gives him potential for a third plus pitch. Fulmer, however, is slight in frame, as he’s listed at 6’0″ and 195 pounds. ESPN’s Keith Law has written on a number of occasions that Fulmer profiles best at the back of a bullpen due to that lack of size, a high-effort delivery and a lack of command. Fulmer’s long-term role with the Sox remains undetermined, but if he’s in the Majors to stay he’ll fall well shy of Super Two status, as the most service time he could accrue in 2016 would be 79 days. He’ll be arbitration eligible following the 2019 season and controllable through the 2022 season if he does not return to the minor leagues from this point forth, though obviously a demotion could further delay his path to arbitration and free agency. Indians president of baseball operations Chris Antonetti joined ESPN’s Buster Olney on his podcast on Tuesday (audio link) and discussed a number of topics, including the recent suspension of Marlon Byrd, the breakout of super utilityman Jose Ramirez, Michael Brantley’s shoulder rehab, the upcoming amateur draft and the club’s financial flexibility as the trade deadline approaches. “I don’t expect that we’ll be limited,” said Antonetti. “In fact, the years in which we’ve been in contention, ownership’s always been great about providing us the resources that we would need to improve the team. I think that we’ll still always have to be cognizant of contracts that we take on, but if there’s the right player out there on the right deal, and the talent return is the right value for us, then I’m confident we’ll be able to improve the team.” Many expect Cleveland to be on the hunt for outfield help with Byrd and Abraham Almonte suspended due to failed PED tests and Brantley’s return still undetermined. The White Sox aren’t planning to simply sit back idly after acquiring James Shields from the Padres, writes Bruce Levine of CBS Chicago. The amount of money that San Diego kicked in to cover the cost of Shields’ contract has the White Sox positioned to add “at least two more important cogs for a playoff push,” per Levine. Chief among the Sox’ needs at this point are a left-handed bat and a left-handed setup man for the bullpen. Levine lists Jay Bruce as a player of interest, though he notes that when the Sox spoke to the Reds about Bruce in Spring Training, Cincinnati was “adamant” that the Sox would have to cover at least $11MM of the $12.5MM that Bruce is earning in 2016. Beyond that, Levine writes that the chances of the South Siders parting with top prospects Tim Anderson and Carson Fulmer in any trade this season, regardless of target, are “close to zero.” For those interested in some names that could be available as targets for the Sox, MLBTR’s Jeff Todd penned an updated list of the game’s top trade candidates earlier today. In other White Sox news, the team will skip the next start of left-hander Carlos Rodon due to discomfort in his neck which eventually extended into his arm, per CSN Chicago’s Dan Hayes (links to Twitter). The Sox had Rodon undergo an MRI as a precaution, but the test revealed no problems. GM Rick Hahn tells Hayes that Rodon wasn’t happy to be skipped, and Hayes notes that the problem appears to be short term in nature, as Rodon has been cleared to return to the mound. Miguel Gonzalez will start in his place on Thursday, and Rodon will rejoin the rotation following that. Byron Buxton chatted with Mike Berardino of the St. Paul Pioneer Press about his recent demotion and the way in which it allowed him to refocus and reevaluate his approach at the plate. As Berardino notes, Buxton has hits in all six games since returning from Triple-A Rochester, including multi-hit games in his past three contests. Buxton batted .336/.403/.603 in his 29 games with Rochester and credited Triple-A hitting coach Chad Allen for helping him to restore his confidence at the plate. While the six games since his return are obviously too small a sample from which to glean any form of definitive insight, it’s also the best stretch of games he’s delivered this season. Before agreeing to take Tatis and Johnson, the Padres asked the White Sox for their two best prospects, shortstop Tim Anderson and righty Carson Fulmer, per ESPN’s Jim Bowden (Twitter link). In an effort to get a quality return for Shields, the Padres reached out to “every team in contention,” including the Tigers, reports Tony Paul of The Detroit News. Tigers executives listened to the Padres’ pitch, but they ultimately balked at their asking price, enabling division-rival Chicago to land the 34-year-old. Shields would have upgraded a Tigers rotation that has gotten particularly disastrous performances from Mike Pelfrey and the now-demoted Anibal Sanchez this year, though it’s unclear what they would have had to give up for him. The White Sox will pay Shields $5MM this year and, if he doesn’t opt out of his contract at season’s end, $10MM in both 2017 and 2018. They’ll also be responsible for a $2MM buyout on his 2019 club option, according to Dan Hayes of CSN Chicago (Twitter link). The White Sox announced today that they have signed first-round pick Carson Fulmer to a minor league contract with a $3,470,600 signing bonus. The announced bonus matches the full slot value of Fulmer’s No. 8 overall selection (slot value via Baseball America). 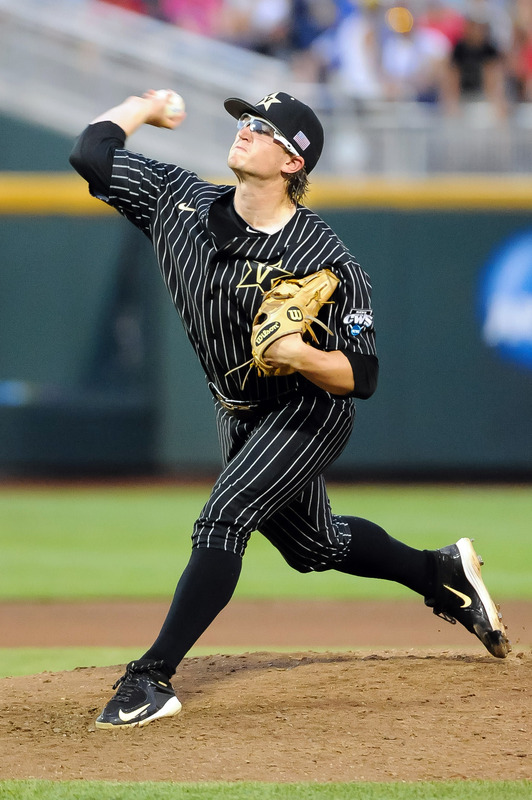 A right-handed pitcher out of Vanderbilt, Fulmer was advised by and is now a client of Icon Sports Management. Fulmer was one of the most interesting available players heading into the draft, with big-time stuff and a track record of excellence in major college ball, but also questions about whether he’ll be a big league starter in the long run. Having dominated the SEC with a 1.83 ERA and 13.1 K/9 against 3.9 BB/9, and featuring a sustainable, mid-90s heater with a very good curve and promising change, Fulmer is about as MLB-ready as drafted players come. So what’s the downside? To an extent, it comes down to how you value near-term contributions versus long-term expectations, as Kiley McDaniel of Fangraphs explained before the draft. Those prospect observers that attributed significant value to his near-big league readiness rated Fulmer as a top-ten prospect (McDaniel had him fifth, MLB.com ranked him 3rd, and Baseball America placed him sixth on its list). But others, concerned with Fulmer’s high-effort delivery, relatively small stature, and lack of a consistent third pitch, put more weight on the idea that he has too great a chance of being relegated tot he pen in the long run. Keith Law of ESPN.com fell in the latter camp, placing Fulmer way down in the 43rd spot on his board. Chicago, obviously, decided that Fulmer’s risky (but still high-ceiling) future outlook was worth taking on in order to add such an immediately impactful arm. With Fulmer now set to join an increasingly impressive stable of controllable starters — led by Chris Sale but also including Jose Quintana and last year’s third overall pick, Carlos Rodon — the White Sox rotation has quite a bit o potential. The team has now signed all of its choices from the first ten rounds.